Eligible for internship opportunities upon successful completion. 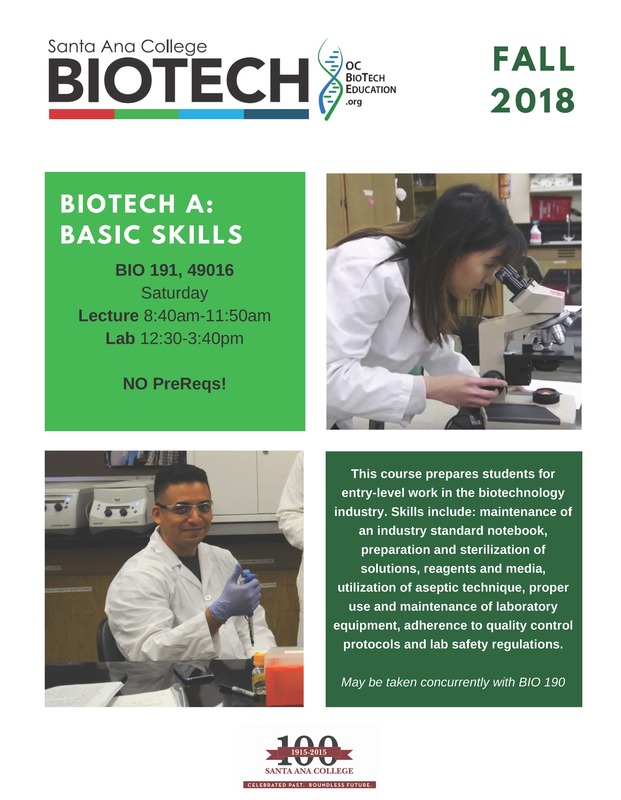 This course will teach students about all aspects of the biotechnology field, with content appropriate for a wide range of students and professionals. Topics will include the biology, business and legal/ethical issues surrounding biotechnology, cells, genes, DNA, proteins, genetic engineering, drug development, biofuels, agriculture, bioremediation, biotechnology company structure, and the regulations affecting the field. 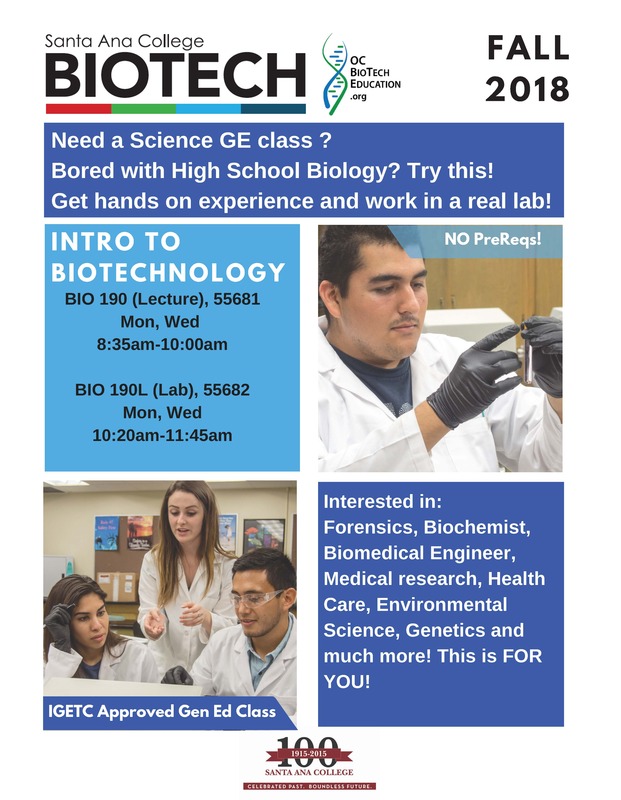 This course prepares students for entry-level work in the biotechnology industry by emphasizing the basic concepts needed to work effectively in a bioscience laboratory. Topics include laboratory math, basic chemistry of buffers, health and safety, metrology, quality control, biological molecules, gene expression, cell structure and molecular biology techniques. This course introduces students to basic biotechnology laboratory skills including basic separation methods, aseptic technique, and documentation. Good communication and work-readiness skills are emphasized. Four hours of lecture, one-hour problem solving, three hours of lab per week. This introductory course emphasizes the principles of inorganic and organic chemistry and includes a lab. It will meet physical science transfer requirements and is required of numerous allied health sciences majors. Prerequisite: BIOL 191 F with a grade of “C” or better. 4 Units: 54 hours lecture and 54 hours lab per term. This course covers fundamental skills in applied biotechnology necessary for any biotechnology laboratory but particularly focuses on downstream manufacturing processes in biomanufacturing. Skills include maintenance of an industry standard notebook, preparation and sterilization of solution, reagents and media, utilization of good aseptic technique, proper use and maintenance of laboratory equipment, adherence to quality control protocols, lab safety regulations, in vitro translation, large-scale expression, purification, modification, western blot analysis, ELISA, antibody tagging, and fluorescent microscopy. This course will cover quality assurance and regulatory compliance for the bioscience industries. Topics will span quality control and Federal Drug Administration (FDA) regulations for the biotechnology, biopharmaceutical, biomedical device and food industries. This course is the first semester of a two-semester sequence designed to provide students with a foundation in general chemistry needed for subsequent courses. Lecture topics include chemical reactions and stoichiometry, thermochemistry and calorimetry, atomic structure and chemical periodicity, chemical bonding, molecular structure, gases, physical properties of solids, liquids and solutions, and organic chemistry. The lab sequence will support the above topics. 18 hours lecture and 54 hours lab per term. This course provides theoretical and practical knowledge and skills on how to culture Eukaryotic cells. Students acquire practical and theoretical knowledge of the structure, equipment, and sterile techniques of the cell culture laboratory, the growth conditions of cells, and how scientists attempt to mimic this in cultures. Among the topics covered are the composition of cell culture media, establishment of primary cultures and cell lines from normal tissue and cancer tissue, routine cultivation of cells, long-term storage, contamination, various methods for characterization of cells, transfection, and the use of cells in culture to resolve various issues in basic and applied research. This introductory survey course will cover the basic concepts of heredity and current advances in biotechnology – such as cloning, recombinant DNA technology, DNA fingerprinting and gene therapy. This course will emphasize the applications, social consequences and ethical implications of biotechnology in medicine and agriculture. 3 lecture semester units. Non-majors course. Three hours of lecture/discussion and three hours of lab per week. Integrated lectures and laboratories are designed to 1) develop a strong foundation in biological facts, concepts, and theoretical models, 2) extend the student’s ability to solve scientific problems through data collection and analysis, and 3) provide training in a variety of lab techniques and instrumentation used in modern biology. Discussion topics which are supported by lab experiences include (a) the molecular basis of life, (b) tissue, (c) enzyme kinetics, (d) gene expression, (e) development, and (f) immunology. 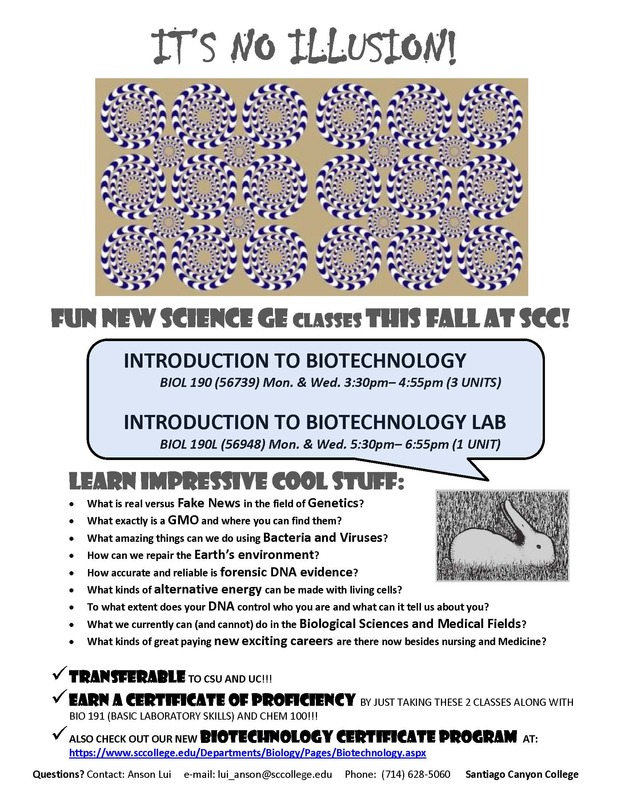 Designed for Biological Sciences majors in transfer programs. 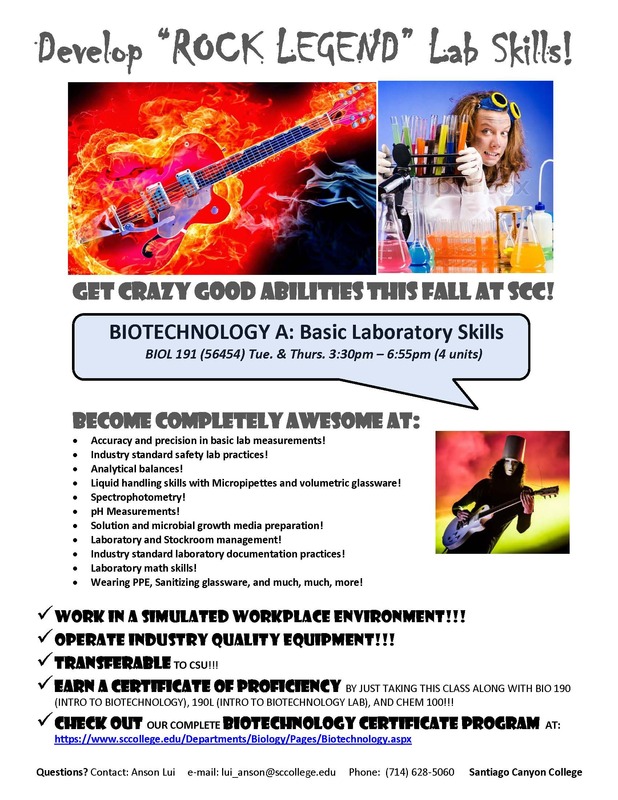 Biotechnology A: Basic Laboratory Skills	4 Units: 54 hours lecture and 54 hours lab per term. This course introduces the fundamental skills in any biotechnology laboratory focusing on the upstream research and development process. Skills include the maintenance of an industry standard notebook, preparation and sterilization of solutions, reagents, and media, utilization of good aseptic technique, proper use and maintenance of laboratory equipment, adherence to quality control protocols, lab safety regulations, DNA/RNA extraction and purification, bioinformatics, polymerase chain reaction, electrophoresis, DNA sequencing, recombinant DNA technology, DNA cloning, transformation, in vitro transcription, fluorescence in situ hybridization, and Southern blot analysis. Compliance with industry standards and regulations will be incorporated into course procedures. Continuation of fundamental chemistry including, but not limited to, ionic equilibrium, acid/base chemistry, thermodynamics and electrochemistry, nuclear chemistry and descriptive chemistry. 5 Units: 54 hours lecture and 108 hours lab per term. This course studies morphology, taxonomy, metabolism, and molecular genetics of microbes with an emphasis on bacteria, protozoa, viruses, helminths, and fungi. The role of microorganisms in the disease process, epidemiology, immunology and chemotherapeutic control measures, environmental impact and industrial application are discussed. Lab exercises focus on the development of basic techniques in aseptic handling, visualization, and quantification of microbes. Other lab exercises include sampling water and soil for medically or environmentally important microbes, assessing antibiotic sensitivity, fluorescent microscopy, and immunoassays. The course is designed for students pursuing a career or major in microbiology and various allied health professions. Presents practical and theoretical aspects of medical microbiology to meet the needs of those in allied health professions. Provides basic knowledge of the microbial world by covering diversity, structure, metabolic and genetic characteristics, cultivation and control. Emphasis is placed in human-microbe interactions especially infectious diseases. Laboratory deals with identification, growth, and control of microorganisms. Prior completion of Biology 109 or 149 recommended. On-the-job training experience with a company or organization. Internships not only help students to build technical skills, it helps them grow their social and networking skills.